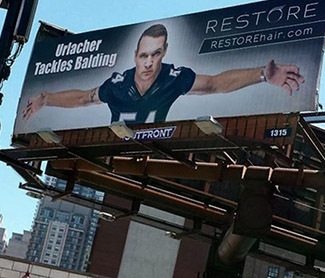 It’s an ad for the company that performed Urlacher’s hair transplant, but also a mantra for his nostalgia-driven franchise. In a city with profound reverence for its lone Lombardi-winning team—conversations about Buddy Ryan’s 1985 defense are still barstool and talk-radio staples—Chicago’s recent deficiencies on D have been especially pronounced since Urlacher retired after the 2012 season. During one 11-game stretch in 2013 and ’14, Chicago surrendered as many 50-point games (three) as it had in its previous 782 regular-season and playoff games combined. As Marc Trestman’s tenure crumbled in 2014, the Bears ranked in the bottom three of the NFL in yards per play (6.0), points per game (27.6) and touchdowns allowed (49). Since the offseason of 2015, Chicago’s new regime—general manager Ryan Pace, head coach John Fox and defensive coordinator Vic Fangio—has razed the defense. Including nickel back, 10 of the 12 projected starters for 2016 were added in the 17 months since Pace took office. And while last season was billed as a season of growth as the team transitioned from a 4-3 to a 3-4 scheme, 2016 could mark a breakthrough. The Bears prioritized inside linebackers in free agency, signing Danny Trevathan away from the cap-conscious, Super Bowl-winning Broncos (four years, $24.5 million) and adding veteran Jerrell Freeman, formerly of the Colts (three years, $12 million). Pace also traded into the Top 10 of the draft to snag a pass-rush threat in outside linebacker Leonard Floyd. The Georgia product’s athleticism will allow him to drop back into coverage as well; he is Fangio’s most gifted student since the coach worked with Aldon Smith in San Francisco. Along with 2015 free agents OLB Pernell McPhee and CB Tracy Porter (rare bright spots last season) and another 2016 signing, defensive lineman Akiem Hicks ($5.5 million guaranteed), Pace flipped a unit that was a liability into one with legitimate expectations. • TALKING FOOTBALL WITH KEVIN WHITE: The Bears receiver is finally ready to start his NFL career. White reflects on the emotional toll of sitting out as a rookie, and the positive outlook on his current health. Urlacher’s face (and, now, hair) serve as a reminder of Chicago’s tradition of great defenses. The Bears were stuck in line waiting for tech help last season. The reboot’s impetus was the arrival of Fangio, whose 49ers unit ranked in the top five in yards allowed in each season of a four-year tenure (one that ended when the team divorced Jim Harbaugh). Fangio’s scheme boils down to a linebacker-run defense, with flexibility in the edge pass rush. The incumbent players needed to retrain instincts for gap assignments. Complicating matters was a rotating cast. Former first-rounder Shea McClellin, tasked with learning his third position since entering the NFL in 2012, flopped as an inside linebacker. The Bears ended up starting six different inside linebacker combinations. Over 16 games, because of injuries and a desire to develop an identity, Chicago utilized six rookies as starters—their 41 combined starts by first-year defensive players was the second-most in the league. • WASHINGTON’S WIDE APPEAL: The pass-catching group in D.C. has it all—shifty slot man, uncoverable tight end, speedy burners and a rising rookie. Is the Kirk Cousins-led offense ready to break out? 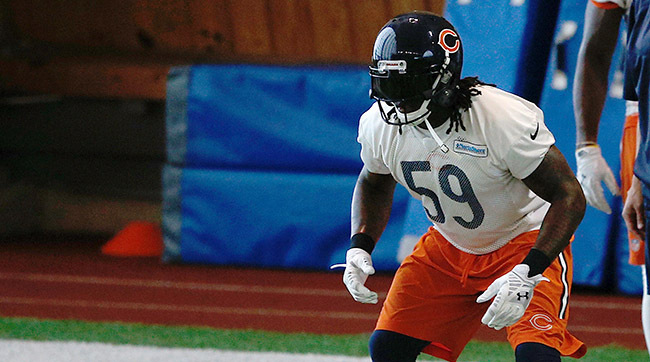 It’s easy to assume Trevathan inked with Chicago to reunite with Fox, his first coach in Denver. When it became clear the Broncos—who locked up Derek Wolfe with a contract extension and needed to set aside significant cash for Von Miller—couldn’t afford to keep the 2012 sixth-rounder, Trevathan signed with the Bears on Day 1 of free agency. To hear the linebacker tell it, the seeds were planted last November. In two years, Pace has really only struck out once: signing Ray McDonald last March. The ex-49ers defensive lineman came with a checkered past; in 2014 he was arrested on suspicion of domestic violence (but not formally charged) and in a separate incident was indicted by a grand jury on a sexual assault charge. Fangio vouched for his former player, who had been released by the 49ers. Bears Chairman George McCaskey personally signed off on the deal. Just 62 days later, McDonald was again arrested on domestic violence charges (he was formally charged two months later). It was the lone high-risk signing for the otherwise conservative GM, who has circumvented splash and rash decision-making. While Pace added four starters from other teams in free agency (Freeman, Trevathan, Hicks, and right tackle Bobby Massie), he jettisoned popular but expensive players at their peaks or just before projected declines (tight end Martellus Bennett, running back Matt Forte and offensive lineman Matt Slauson).